One must follow Tirumala Seva dress code while planning for Special Darshan at Tirumala. The T.T.D message is clear. The dress worn by pilgrim should be a “decent outfit” before he/she enters the temple for Lord Sri Venkateswara darshan. Traditional outfits are allowed. Normal trousers is allowed. For Rs.300 ticket there is no strict dress code applicable. Any outfit is allowed but for Sri Venkateswara Darshan one should plan in a decent outfit. Strict Dress code applies only for Seva tickets and Break Darshan tickets. Dress code” for VIP pilgrims who want to have the break darshan of Lord Venkateswara in the morning and evening should follow Dress Code. A woman devotee can wear saree or a chudidar with chunni, whereas a male devotee can wear dhoti or lungi with uttareeyam or kurta-pyjama. 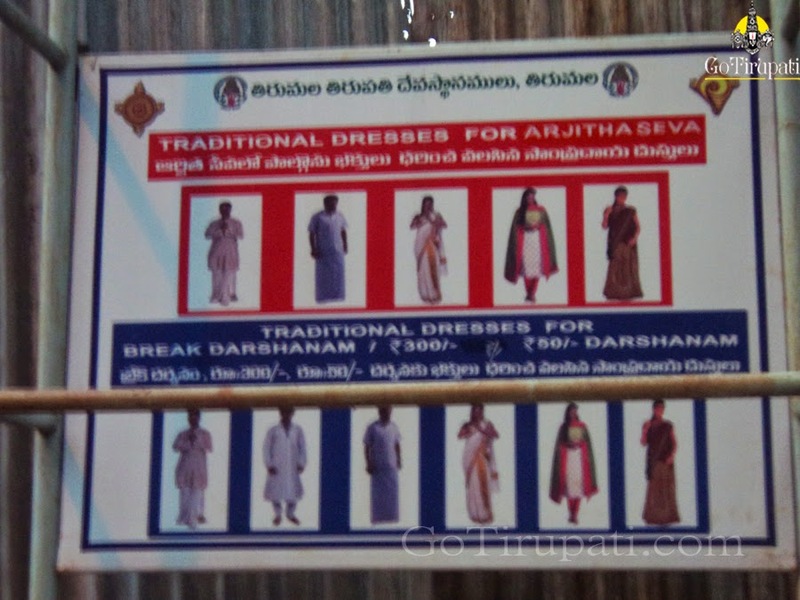 “A simple shirt and trousers are also allowed, but it would be ideal if men wear dhoti and uttariyam. And if any devotee forgets to follow the dress code, he or she will be advised to change the dress before entering Queue Complex. For Kalyanam and other sevas the Dhoti & Uthareeyam for men and Saree or a chudidar with chunni for women is mandatory. Not allowed : Bermudas, T-shirts, jeans, shorts any western outfit exposing body parts is not permitted. Same applies even to the foreign devotees and they should cover their body before entering the Queue complex.